WhatsApp has been trying out a bunch of new features over the past year, and now, it is said to be rolling out updates to its Android beta app that brings the code of two key new features called Consecutive Voice Messages and Group Call Shortcut. The first of the new functionalities enables WhatsApp to play multiple audio messages consecutively, while the other provides a shortcut button for users to make group calls. Both the new features are not available for WhatsApp for Android beta testers as of now, and will be remotely enabled in the future. According to a report, the code of features have arrived for Android users with beta versions 2.18.362 and 2.18.363, respectively. Notably, the same features had previously rolled out to WhatsApp beta for iOS. 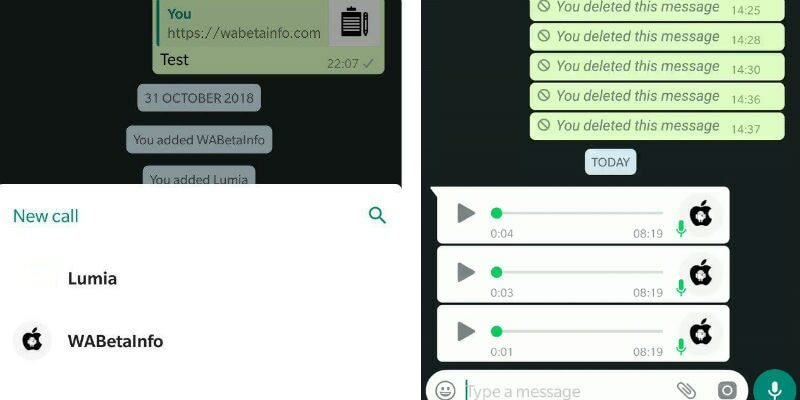 First up is the Consecutive Voice Messages feature that enables the WhatsApp Android app to play consecutive voice messages one after the other, WABetaInfo reports. The feature works when WhatsApp detects two or more voice messages. All you need to do is to tap the Play button on the first audio, following which WhatsApp will automatically play all the other voice messages in a sequence. In the end, you will get a sound alert as well. The functionality was previously seen on WhatsApp for iOS (version 2.18.100). As mentioned, the feature is only visible in the code of Android beta version 2.18.362 app, and will reportedly be remotely enabled. Coming to the second new feature, the latest WhatsApp for Android iOS beta version 2.18.363 bring UI changes for group calls. This feature was earlier spotted on WhatsApp for iOS. When the feature rolled out to your app, there will be a new group call button in group chats. Once you tap on that button, it opens up a sheet with all the members of the group. Further, you will have to tap the audio or video call button to start the group audio or video call. WABetaInfo notes that the feature is disabled by default, and should be remotely enabled in future beta updates. We were unable to spot either the Consecutive Voice Messages feature or new group calls UI in the respective Android beta versions (2.18.362 and 2.18.363), or even the newer beta app (version 2.18.364). Meanwhile, to download the latest WhatsApp beta on your Android device, you need to be a part of the official Google Play beta programme. Alternatively, you can download its APK file (version 2.18.362 and version 2.18.363) directly from APK Mirror. What do you think of the new features? Will they be useful to you? Let us know in the comments below. Copyright © 2019 Optioncockpit. All rights reserved.